The annual Melissa Laser Fish Habitat Conservation Award is bestowed upon individuals deemed to further the conservation, protection, restoration, and enhancement of habitat for native Atlantic coastal, estuarine-dependent, and diadromous fishes in a unique or extraordinary manner. The award was established in memory of Dr. Melissa Laser, who was a biologist with the Maine Department of Marine Resources where she worked tirelessly to protect, improve, and restore aquatic ecosystems in Maine and along the entire Atlantic coast. 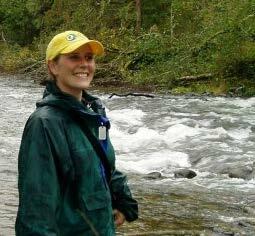 Melissa was an astute strategic thinker, editing and coordinating the Strategic and Operational Plan for the Restoration of Diadromous and Resident Fishes to the Penobscot River. She coordinated fish passage projects, working with barrier owners on management options, writing grants to fund projects, and tracking and prioritizing connectivity projects. As a leader, she managed and oversaw the biological field staff for the Maine Western Region and was the Bureau of Sea Run Fisheries and Habitat Program lead for habitat restoration studies and projects. She was also an effective champion for Atlantic salmon, directing and coordinating Endangered Species Act-related actions pertaining to the species, and assisting the Bureau Director with development of the Atlantic Salmon Decision Making Framework. Melissa brought her smiling dedication and enthusiasm to ACFHP’s Steering Committee and the Atlantic States Marine Fisheries Commission’s Habitat Committee. Her contributions to these committees and to her home state were tremendous. She is deeply missed. We are currently accepting 2019 award nominations, which should be sent to Lisa Havel (LHavel@asmfc.org) by April 26, 2019. Please refer to the 2019 Melissa Laser Fish Habitat Conservation Award Instructions for more information on the award and the process to submit nominations. what qualities the individual or individuals possess that set them apart from others. letters of support are welcomed but not required. The award will be presented at the 78th Annual Meeting of the Atlantic States Marine Fisheries Commission in October 2019 in New Castle, New Hampshire.